In the jungle, the mighty jungle, your family sleeps tonight! This newly refurbished, jungle inspired 4 bedroom home will make you feel like you’ve stepped into a tropical paradise! You’ll notice right away the African inspired décor, warm colors and luxurious furniture. 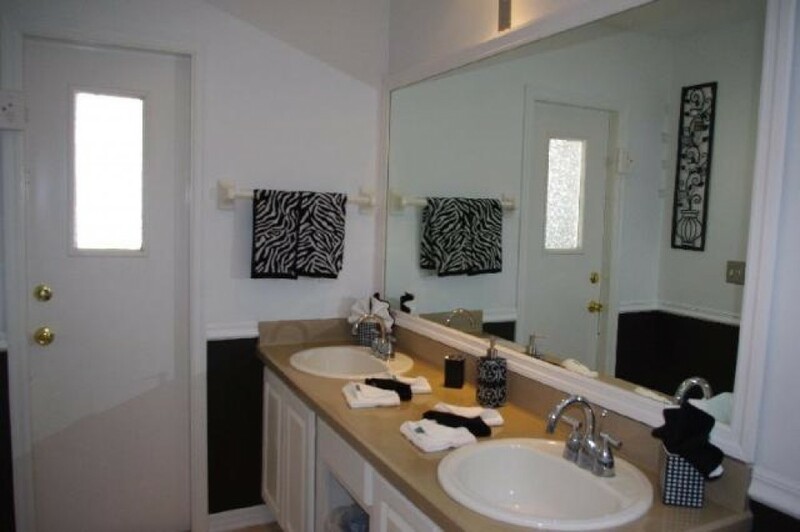 You’ll feel like the King and Queen of the jungle in the gorgeous master suites, complete with a zebra themed bathroom. This master bathroom has a walk in shower, double sinks and private access to the pool, perfect for a late night swim after the kids go to bed. Two twin rooms provide enough for space for the little monkeys to rest after a busy day at the parks or in the pool. Each twin bedroom has its own flat screen TV The fourth Queen bedroom is complete with a flat screen TV and a beautiful dresser and mirror combination. There is a 46” flat screen in the living room, and room for the whole pack to sit and enjoy a movie together. The leather furniture is top of the line and brand new, and the leather bar seating allows the whole family to enjoy a snack while spending time together in the living room. The kitchen is fully equipped, and makes cooking dinners at home a breeze. You can save so much money by taking advantage of this kitchen compared to going out to eat for every meal. Have the chef of the family fire up the BBQ and serve dinner on the lanai! Whether you choose to eat in the kitchen, at the bar or in the formal dining room, everyone will have plenty of elbow room. A jungle would not be complete without a cool place to beat the heat. This pool and spa overlooks a golf course, so you’re not backed up to rear neighbors. There are plenty of loungers out by the pool, for those who like to “lion” the shade. Beautiful patio furniture sits under a shaded lanai complete with a fan, perfect for poolside lunches or a cocktail after the sun goes down. This jungle home has something that no other vacation home has to offer; a kid sized jungle getaway! Complete with bamboo, various plants and countless jungle animals. There is also a TV hidden in this jungle. Your children will spend hours in the jungle huts that are just their size. In this jungle you will find child size animal chairs and tables, a jeep to sit & play in, a child-size kitchen & bbq, and much more! It's the perfect place for letting their imagination run wild!